This is a modelling tutorial aimed squarely at beginners to Imagine. The tutorial will take you through the construction of a six faced die. "How hard is that!?" I hear you cry :) "We could just extrude a plane!" say you. Well, This die is one of those round faced jobs with the lovely bevelled edges, and building it will clue you up on a few modelling techniques that can be applied to a whole heap of other stuff. Oh yes. Note: axi that I don't mention, should be left at default. Add a primitive disc. Open the transform dialogue, check position and make X-60. Check alignment and make Z -90. Add a second disc. Make position Y -60. Add a third disc. Make position Z 60. Make alignment X 90. Your views should look just like the one in the image on the left. 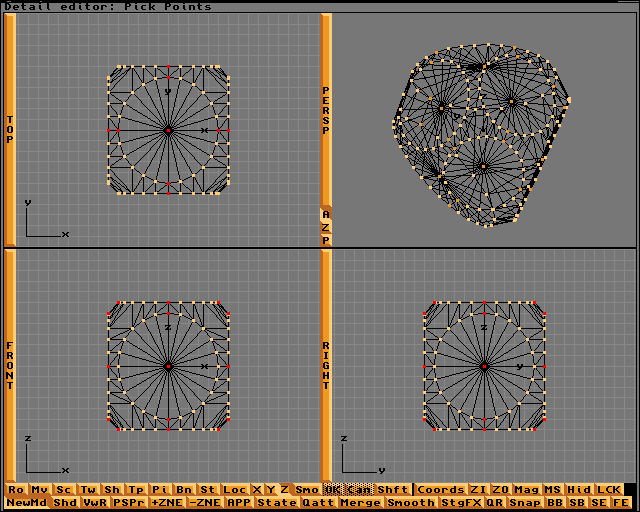 Now you have the discs arranged and aligned, you need to add a central Axis to make life a bit easier later on. Make sure the workspace is centred (project->reset view) and add a new axis F4. Select the new Axis F1. With the axis selected, you need to select all the other objects. Press A/alt a or shift/click the objects to multi-select. With all objects selected, join the objects together so that they become a single object A/alt j. 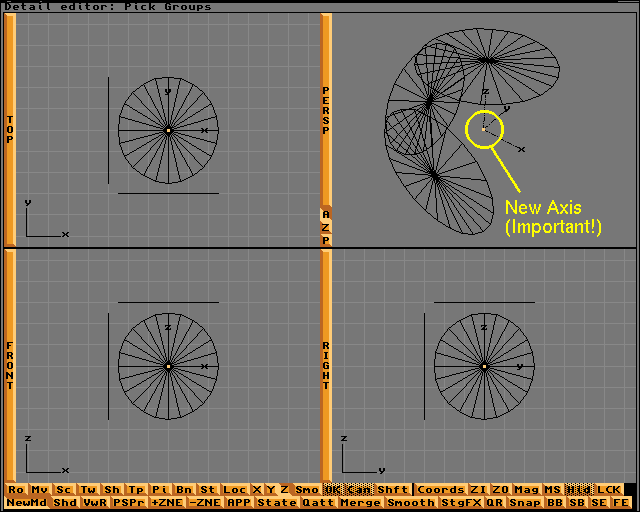 You will now see only 1 object axis in the centre of the workspace. Check your view against the image on the left to make sure you got it right. Select the object. Go into pick points mode a/alt 3. You need to shear away a few points. In Front View delete all points in -Z (all below the centre) and all points in +X (all to the right of centre). 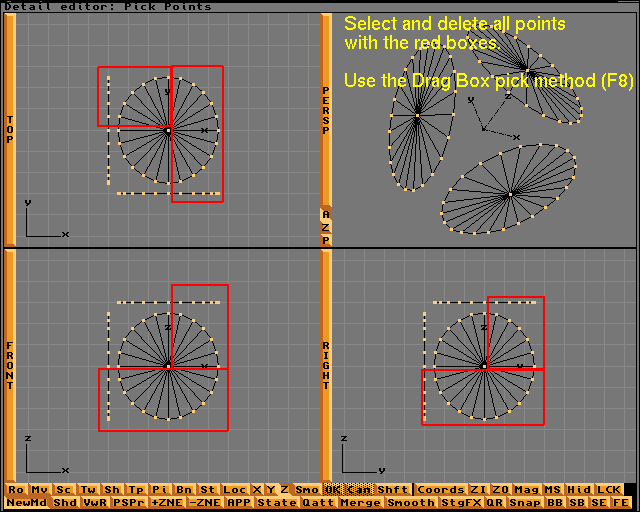 In Top View delete all points in +Y (all above centre) Use the drag box pick method and shift to multi pick points. 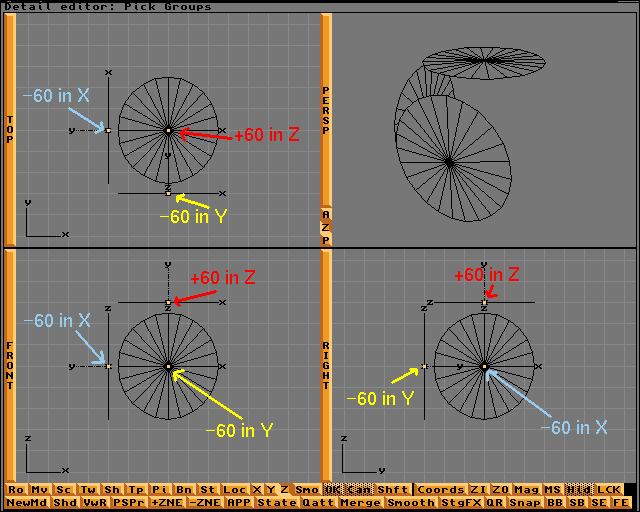 Refer to the image on the left which shows what I mean graphically. Oh yes. It's actually very easy, and combined with fill to edge line, a very powerful feature. We'll not be using fill to edge here, as we are only adding a hand full of faces. Go into the perspective view. Place the pointer at the top left edge of the object, then clicking and holding the left mouse button, drag the pointer to the centre of thee view. That should give you a good view of the whole corner edge. Select New Mode from the display menu. NEW MODE IS YOUR FRIEND! Use it a lot. Go into add faces mode a/alt 8, and turn off perspective rotation(click the little P to unselect it). Now you can begin adding faces. Take a look at the image, and you'll see the faces you need to add. I've coloured the edges, and filled the faces, so they show more clearly. Work your way across the object adding new faces. The Image on the right shows what you need do very clearly. The final stage is to Copy, paste, and mirror your object into a fully faced die. Go back to a quad view, and select the object. Copy it, a/alt c and open the transform dialogue. We shall be mirroring the object. Check scale, and then check world (to avoid me confusing myself :)). Enter -1.0000 in the X field. You will now see that the object has been mirrored. Hurrah! Paste down the previously copied object. Press shift and F1 to select both objects. Join them so that you have a single object. 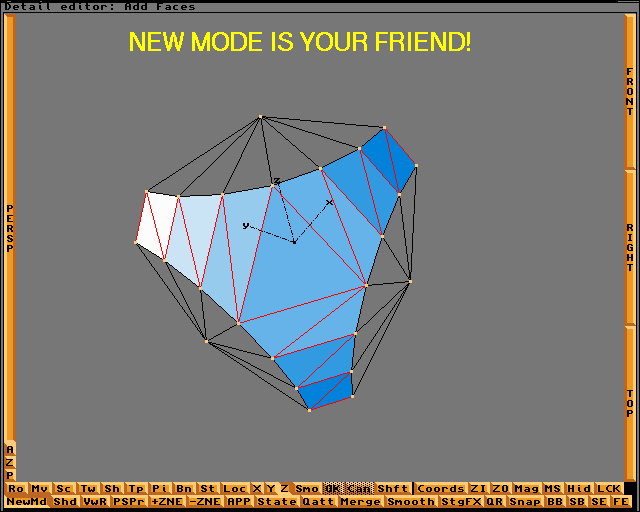 Copy the joined object, and repeat the above process, but substitute X with Y in the transform dialogue Now you should have the whole top half of the die. When I said that the last bit was the final stage; I lied. There's one thing you should always do to every single model you ever make. Select all of it's points, and merge them. The reason you merge, is because you will have duplicate points in your model. In this die, there will be duplicate points all around the centre of the object, and they will cause a seem to show when you render. One thing to note. For some very bizarre reason, not all the points will merge! The suspect points look as though they share the same space, but they are actually a fraction of a unit apart. Weird, eh? I have selected the points that are likely to give you grief in the image on the right. To get them right for merging, they need to be snapped to the grid. 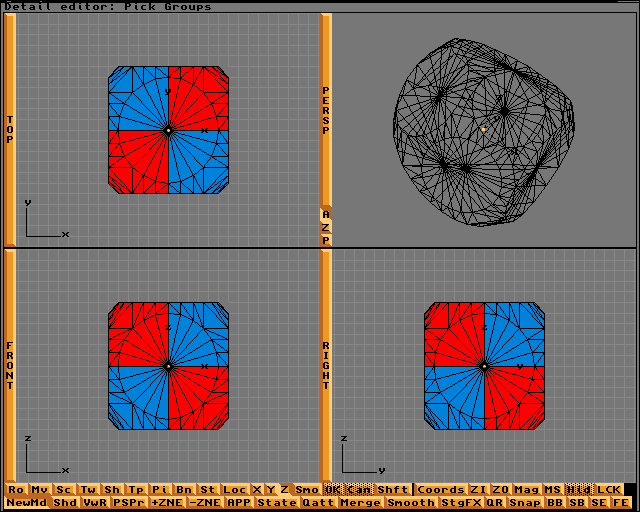 Select the points shown in the image, and set the grid size a/alt - to 0.1. Snap the points to the grid, then merge again. 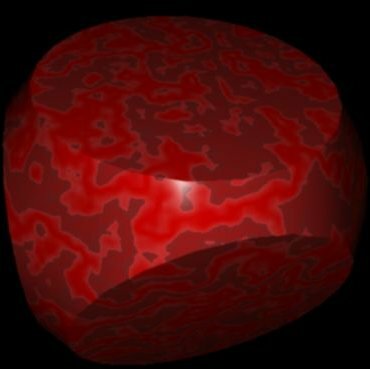 You should end up with an object looking like this (texture added for clarity). . .